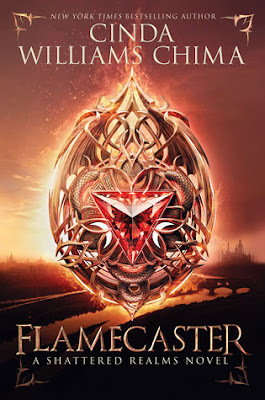 Thanks to HarperCollins, I have an extra copy of Flamecaster by Cinda Williams Chima to give away to one lucky US reader. Flamecaster just came out last week and is receiving some great reviews. It's the start of a new four book fantasy series. I love the sound of it! Goodreads says, "Adrian sul’Han, known as Ash, is a trained healer with a powerful gift of magic—and a thirst for revenge. Ash is forced into hiding after a series of murders throws the queendom into chaos. Now Ash is closer than he’s ever been to killing the man responsible, the cruel king of Arden. As a healer, can Ash use his powers not to save a life but to take it? Abandoned at birth, Jenna Bandelow was told that the mysterious magemark on the back of her neck would make her a target. But when the King’s Guard launches a relentless search for a girl with a mark like hers, Jenna assumes that it has more to do with her role as a saboteur than any birth-based curse. Though Jenna doesn’t know why she’s being hunted, she knows that she can’t get caught. Eventually, Ash’s and Jenna’s paths will collide in Arden. Thrown together by chance and joined by their hatred of the king, they will come to rescue each other in ways they cannot yet imagine. Set in the world of the acclaimed Seven Realms series a generation later, this is a thrilling story of dark magic, chilling threats, and two unforgettable characters walking a knife-sharp line between life and death." The deadline for this giveaway is April 24th and please refer to my giveaway rules. Good luck! This sounds really good. I've been wanting to try her books for awhile but just haven't gotten around to it yet.